Israeli forces continued with systematic crimes in the occupied Palestinian territory (oPt) for the week of 14- 19 September 2017. 7 Palestinian civilians, including a child, were wounded in the West Bank and Gaza Strip, while Israeli forces continued to target the border areas of Gaza, with no casualties reported. During the reporting period, 7 Palestinian civilians, including a child, were wounded in the Gaza Strip and West Bank. Three of them were wounded in the West Bank while four others, including a child, in the Gaza Strip. Moreover, Israeli naval forces continued to chase Palestinian fishermen in the Gaza Sea and target the border areas. In the West Bank, on 15 September 2017, 2 Palestinian young men were hit with rubber-coated metal bullets in a protest organized by dozens of Palestinian civilians in the vicinity of a military watchtower established north of ‘Aidah refugee camp, north of Bethlehem. The demonstration was organised in protest at burying the corpses of 4 Palestinian victims detained in the Israeli cemeteries of numbers. On 17 September 2017, a 20-year-old male was hit with a rubber-coated metal bullet to the right leg when the Israeli forces moved into Qalqliyia, in order to arrest Palestinian civilians. In the Gaza Strip, border areas witnessed protests against the unjust closure imposed on the Gaza population. During these protests, Israeli forces used force against the protestors, particularly when dispersing them. As a result, 4 Palestinian civilians, including a child, were wounded while participating in a protest organized in the east of Jabalia refugee camp, north of the Gaza Strip. In the context of targeting Palestinian fishermen offshore, on 15 September 2017, Israeli gunboats sporadically opened fire at the Palestinian fishing boats, northwest of Beit Lahia in the northern Gaza Strip, and chased them. The shooting recurred in the abovementioned area on 16 and 18 September 2017. No casualties were reported, but the Israeli naval forces arrested 2 fishermen who are also brothers and confiscated their fishing boat. On 18 September 2017, Israeli gunboats sporadically opened fire at the Palestinian fishing boats, west of al-Sudaniyia shore, north of the Gaza Strip and chased them. The shooting recurred in the abovementioned area before midnight. In the context of targeting the border areas, on 17 September 2017, Israeli forces stationed along the border fence opened fire at the agricultural lands in ‘Abasan village, east of Khan Younis. However, no casualties were reported. During the reporting period, Israeli forces conducted at least 65 military incursions into Palestinian communities in the West Bank, and 7 ones in Jerusalem. During these incursions, Israeli forces arrested at least 48 Palestinian civilians, including 8 children and a woman. Sixteen of them, including 3 children and a woman, were arrested in occupied Jerusalem and its suburbs. As part of house demolitions, on 18 September 2017, Israeli Municipality vehicles demolished an under-construction residential apartment belonging to the sons of late ‘Issa Abed al-Fattah Matour under the pretext of non-licensing. The apartment is on the 2nd floor added to the house exiting before the occupation of Jerusalem, sheltering Issa’s Family of 20 members. Following the House demolition, the 1st floor was mostly damaged and became uninhabitable due to cracks in the walls and ceilings. 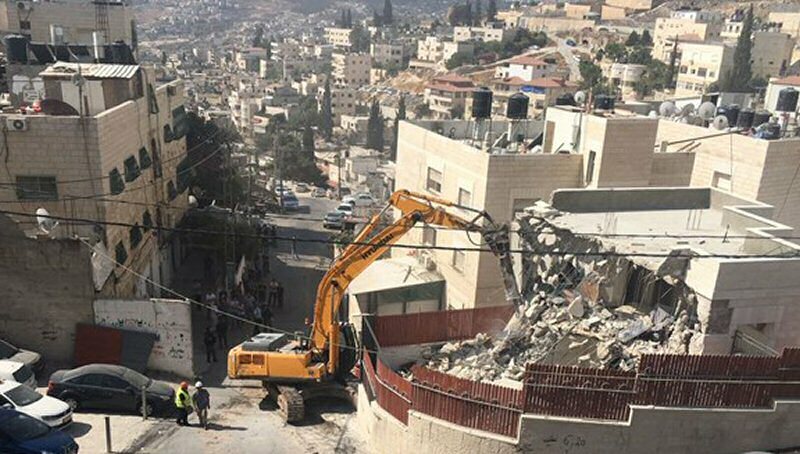 On 19 September 2017, the Israeli Municipality demolished a commercial facility belonging to Bashar Bader in Beit Haninah neighborhood, north of occupied East Jerusalem. The abovementioned facility is a car wash and showroom of 4 barracks. The Israeli forces also levelled the land, where the facility was established. Bader said that the court delayed the demolition decision to 28 September 2017, but he was surprised with the facility being raided and completely deolished. As part of settlers’ attacks, on 14 September 2017, Israeli settlers from “Bracha” settlement, south of Nablus, moved into Kafur Qaleel village, south of Nablus, and cut down 40 fruitful olive trees with automatic saws. Those trees which are one kilometer away from the settlement belong to Fathi Rasheed Mnsour and Jaser Abed al-Jabbar. Following the Friday, 15 September 2017, dozens of Palestinian residents from Hebron organized a demonstration in front of ‘Ali al-Bakaa’ Mosque in the city in protest against the Israeli authorities’ decision to build a municipality for settlers in Heron’s Old City. The participants raised Palestinian flags and chanted national slogans. When the protestors approached the old municipality building, dozens of Israeli soldiers moved towards them and pushed them back. They heavily fired sound bombs and tear gas canisters in the area to force the participants to withdraw. After a while, the participants withdrew from the area. Around the same time, dozens of residents from Kherbet Qalqas, east of Hebron, organized a peaceful protest to reopen the road to the village that was closed 14 years ago. The resident had to take a bumpy road to reach the street that leads to the city. They raised banners demanding to open the road. Israeli force arrived at the area and fired sound bombs and tear gas canisters at the protestors. They also chased them into the olive fields. The Israeli forces arrested Taha Hamad Mohammed ‘Abas (22) and Suheib ‘Awni Abu Turki(19). Following the Friday praying, dozens of Palestinians organized a peaceful march which started from Abu Bakr Al-sedeeq Mosque in Aida camp, north of Bethlehem towards the military watchtower near the camp, protesting against Israeli authorities burying corpses of Palestinians detained by them in cemeteries of numbers. When the demonstration arrived in the vicinity of the military watchtower, the Israeli forces intensively fired live and rubber-coated metal bullets and gas canisters towards them. As a result, two young men were hit with rubber-coated bullets. The Aida refugee camp residents said that the Israeli forces intentionally fired gas canisters at the civilians’ houses; dozens suffered tear gas inhalation. Moreover, parts of a house belonging to Monther ‘Amirah, activist in the Polular Comittees, were burnt. It should be mentioned that on 13 September 2017, the Israeli Public Prosecution declared the burial of 4 Palestinian corpses in cemeteries of numbers for: Abd Al-Hameed Abu Srour from Aida camp, Mohammed Al-Tarayra and Mohammad Al-Faqeeh from Hebron, and Rami Ourtani from Nablus. Following the Friday prayer, dozens of Palestinian civilians and Israeli and international human rights defenders organized protests in Bil’in and Ni’lin villages, west of Ramallah; al-Nabi Saleh village, northwest of the city. Israeli forces forcibly dispersed the protesters, firing live and metal bullets, tear gas canisters and sound bombs. They also chased protesters into olive fields and between the houses. As a result, some of the protesters suffered tear gas inhalation while others sustained bruises as Israeli soldiers beat them up. Israeli forces also arrested an Israeli peace activist when they chased the protestors. At approximately 16:30 on the same Friday, 15 September 2017, dozens of Palestinian civilians gathered near the border fence between the Gaza Strip and Israel, east of Jabalia in the northern Gaza Strip, in response to calls for protests in the border area against the Israeli imposed closure on the Gaza Strip. Some of the young men set fire to tires and threw stones at the Israeli forces stationed along the abovementioned border fence. The soldiers fired live bullets, tear gas canisters and rubber-coated metal bullets at them. The clashes continued until approximately 19:30 on the same day. As a result, 4 civilians, including a child, were directly hit with tear gas canisters. They were transferred to the Indonesian Hospital in Jabalia. Medical sources classified as minor. At approximately 08:00 on Monday, 18 September 2017, Israeli bulldozers accompanied with Israeli Municipality vehicles demolished a residential apartment in Za’eem village, east of the city, under the pretext of non-licensing. Matour family said that the Israeli forces accompanied with Israeli Municipality crews raided their building in Za’eem village and evacuated all residents. They then demolished the 2nd floor without prior warning. The family also said that the 2-storey building belongs to the sons of late ‘Issa Abed al-Fattah Matour. The 1st floor, which shelters the 20 members of Issa Family, exited before the Israeli occupation of Jerusalem while the 2nd floor is under-construction. The family added that the 1st floor was completely damaged and became uninhabitable due to cracks in the walls and ceilings. At approximately 11:00 on Tuesday, 19 September 2017, the Israeli Municipality demolished a commercial facility in Beit Haninah neighborhood, north of occupied East Jerusalem. The abovementioned facility is a car wash and showroom and belonging to Bashar Bader. Bashar said that the Israeli police accompanied with Israeli Municipality crews and bulldozers raided the facility and demolished all the 4 barracks in addition to leveling the land. Bader also said that the court delayed the demolition decision to 28 September 2017, but he was surprised with raiding the facility and demolishing it completely. On Thursday, 14 September 2017, Israeli settlers from “Bracha” settlement, south of Nablus, moved into Kafur Qaleel village, south of Nablus, and cut down 40 fruitful olive trees with automatic saws. Those trees, which are one kilometer away from the settlement, belong to Fathi Rasheed Mansour and Jaser Abed al-Jabbar. Mansour said that the Israeli settlers cut down 20 olive trees of 70 from his 3-dunum plot of land. He is also afraid that the settlers would cut down the other trees, as he along with other civilians saw the Israeli settlers wandering in the same land on the same day, but chased and expelled them from his land. He also added that about 20 olive trees out of 300 were cut down from a 25-dumun plot of land belonging to Abed al-Jabbar. In his intervention, ‘Issam Younis stressed that submitting this legal communication to the ICC is very important to the road of bringing justice and remedy for civilian victims. He pointed out that the Palestinian human rights organizations will continue to fight via all possible legal means in light of the shutting down the Israeli judiciary doors to Palestinians. Younis explained that there is an Israeli campaign to frighten the human rights organizations and impose restrictions on them in an attempt to fail the legitimacy. 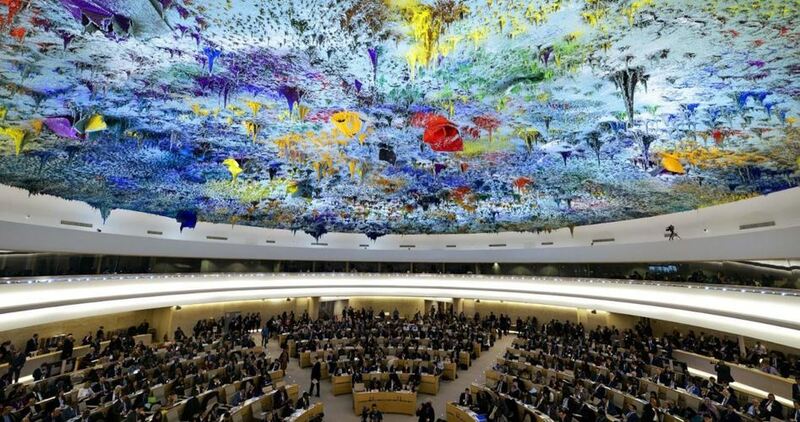 However, this will not prevent the human rights organizations from continuing their work to gain justice. Younis added that the crime of settlement activity is the most serious crime and violates of the Fourth Geneva Convention. Moreover, there are actions on the ground to change the demographic status and unprecedented political procedures in the Israeli Keenest to legalize settlements. He said that all of this happens in light of the international community silence that encourages Israel to do so. An overwhelming majority of Palestinians is worried about the future of liberties in Palestine and two-thirds demand the resignation of President Mahmoud Abbas and half of the public views the Palestinian Authority as a burden on the Palestinian people, a poll conducted by the Palestinian Center for Policy and Survey Research (PSR) in cooperation with the Konrad-Adenauer-Stiftung in Ramallah between 14-16 September 2017 found out. According to the report, the findings of the third quarter of 2017 show that an overwhelming majority of the Palestinian public is worried about the future of liberties in Palestine. This prevailing perception seems to be driven by the recent increase in the incidents in which journalists and activists have been arrested, by the recently announced presidential decree enacting a cybercrime law, and by the government proposed amendments to the Law of the Judiciary. A large majority believes that Palestinians cannot criticize the PA without fear. 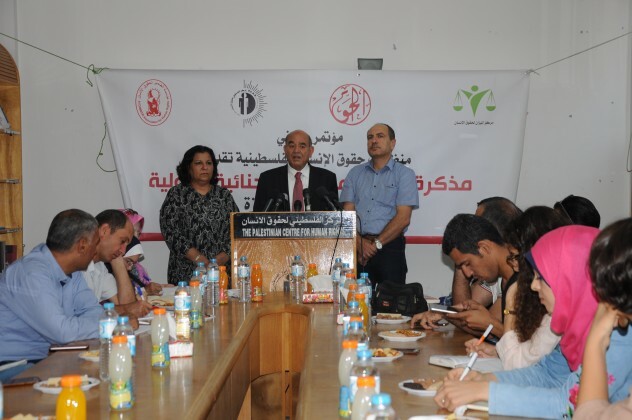 In fact, half of the public believes that the PA has now become a burden on the Palestinian people. This worry about the future of liberties, along with the concerns about the steps taken by the PA against the Gaza Strip, might be responsible for the increase in the demand for the resignation of President Abbas and the decline in his popularity compared to that of Hamas’s potential presidential candidate, Ismail Haneyya. 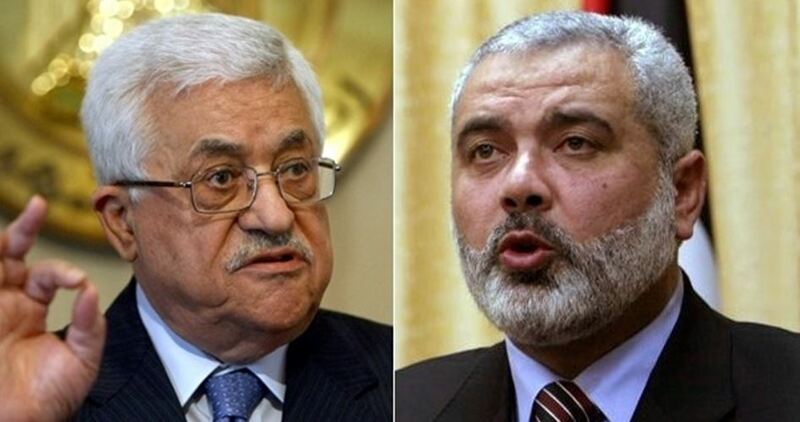 The poll found out that today 80% of Gazans want Abbas’s resignation, satisfaction with the performance of the president is about 20%, and it is certain that he would lose any presidential elections in the Gaza Strip to Hamas’s Haneyya. Moreover, Fatah is fast losing its popularity in the Gaza Strip, standing at 28% today compared to 40% only nine months ago. Findings show that 67% of the public want president Abbas to resign while 27% want him to remain in office. Three months ago, 62% said they want Abbas to resign. Demand for Abbas’s resignation stands at 60% in the West Bank and 80% in the Gaza Strip.